Sew a felt lovebird softie! A simple beginning sewing project for children and adults of all ages. Use the free printable pattern to teach children how to sew a softie by hand. 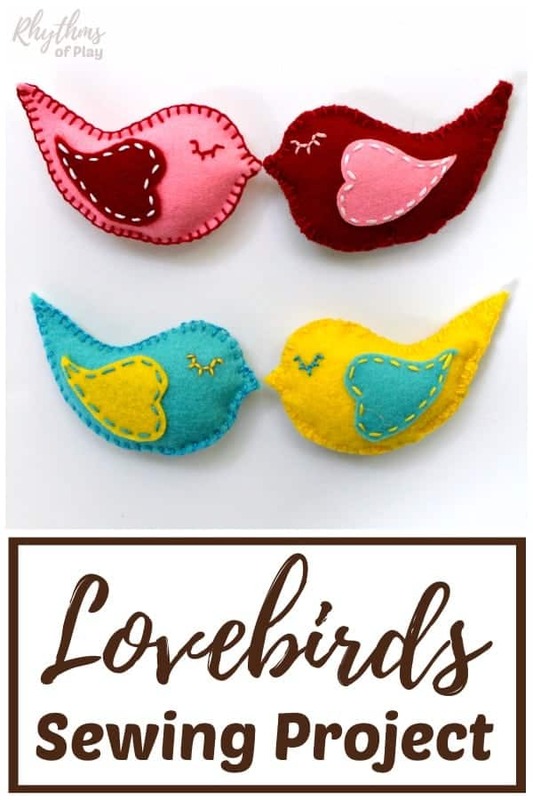 A pair of lovebirds make a cute hand sewn gift idea kids can make for Valentine’s Day, Mother’s Day, or Father’s Day! This post was created in honor of Sew a Softie. Join the sew a softie initiative by learning to sew a softie with your child, teaching your child how to sew, or inviting your child to become an ambassador to other children learning to hand sew. Learn more about Sew a Softie HERE! My daughter and I LOVE designing and sewing softies together. We made a lovebird beginning sewing pattern to use as a printable template to make sewing a softie easy! Read through these directions before starting to sew a lovebird felt softie. If your child has never sewn by hand before, try our burlap and yarn beginning sewing tutorial, or teaching children how to sew a running stitch. Step 1 – Download and print free lovebird sewing template onto cardstock. Print the free lovebird sewing template onto cardstock or draw your own lovebird softie pattern. Cardstock creates a nice thick beginning sewing pattern that can be easily traced with a disappearing ink pen . Step 2 – Cut the lovebird and heart wing out of the free printable lovebird template. 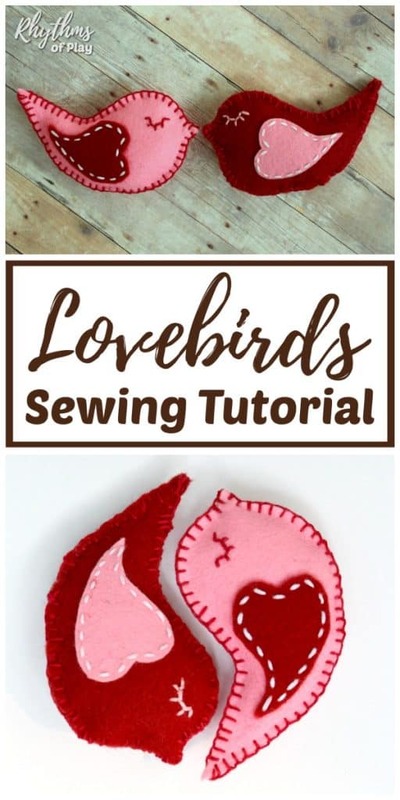 Cut the lovebird and heart wing out of the free printable lovebird beginning sewing pattern for each lovebird. Step 3 – Use a disappearing ink pen to trace the lovebird and wing template onto the felt. Trace two lovebirds and two hearts in one color and another pair of lovebirds and wings in a complementary or contrasting color to make a lovebird pair. 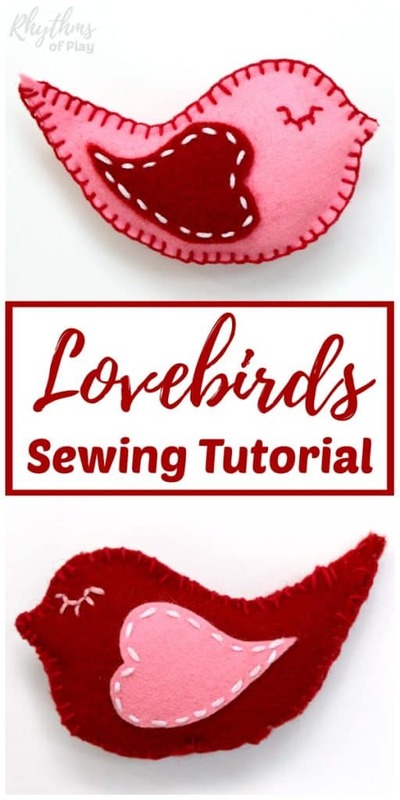 Don’t forget to flip the lovebird and heart wing pattern over to trace the other side so you have 2 lovebirds and wings in the same color that mirror each other to make each lovebird felt softie. Disappearing ink will disappear in about 24 to 48 hours, or it can be rinsed with water to be removed. 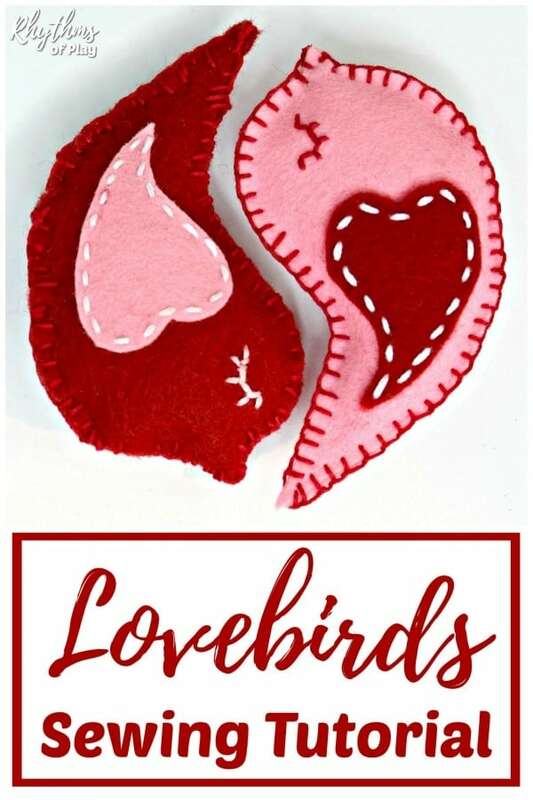 Cut the lovebirds and lovebird wings out of the felt after you trace the lovebird pattern or the lovebird pattern might disappear before you have a chance to cut it out! Step 4 – Sew a felt wing onto each felt lovebird. Choose embroidery thread in contrasting or complementary colors to use to sew each lovebird pair. 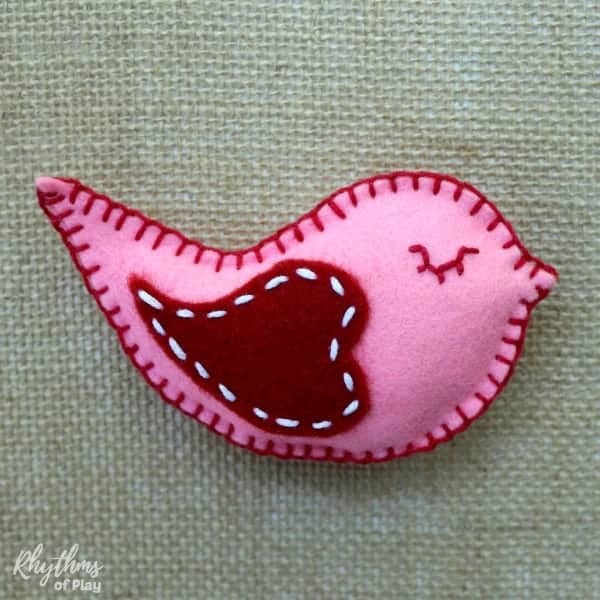 Use a whipstitch or a running stitch to sew each felt heart wing onto each felt lovebird half. A handsewn running stitch is pictured. Make sure that you sew the proper felt wing on the proper side of the felt lovebird so that when the two sides of the felt lovebird are sewn together the hearts are on the outside with the tip of the heart pointing towards the tail. Step 5 – Use disappearing ink to draw an eye on both sides of the lovebird felt softie. Use a disappearing ink pen to make a dot or a “U” shape with lashes to create an eye for each side of the felt lovebird. 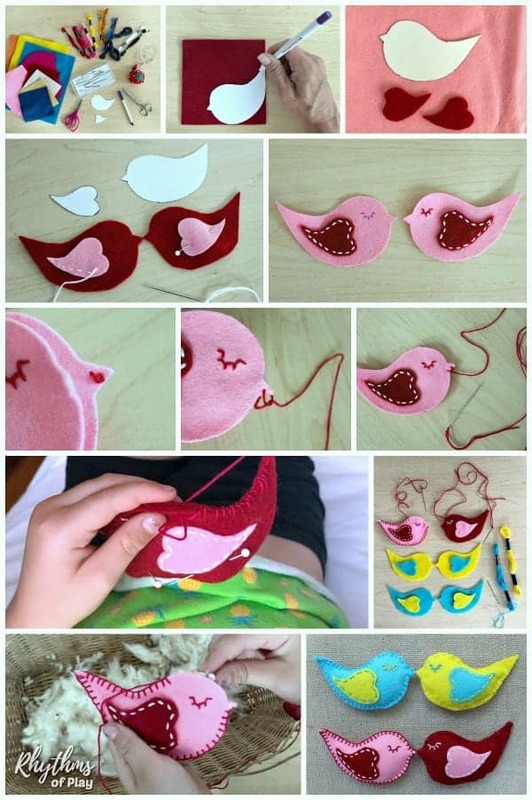 Step 6 – Sew the eyes on felt lovebird halves. We sewed a closed eye with lashes for each felt lovebird. 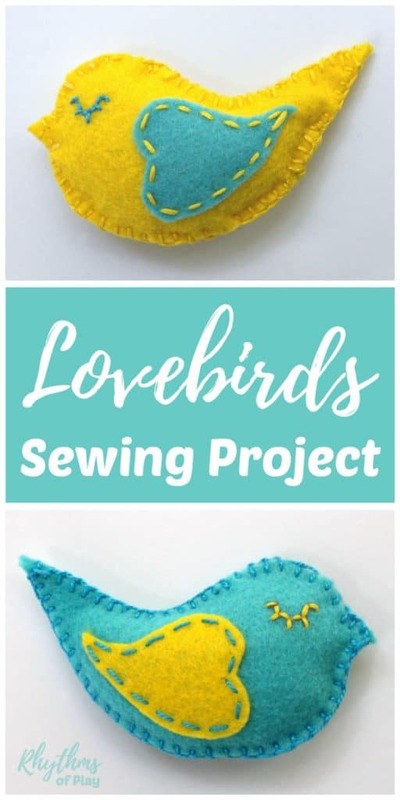 Alternatively, you can sew a french knot or use a small seed bead to create an eye for each side of the lovebird felt softie. Step 7 – Sew the sides of the lovebird felt softie together. Use a whipstitch, running stitch, or blanket stitch to bind both sides of the lovebird to each other. We have found that children have the easiest time hand sewing whipstitch when they are learning to bind softies together. My daughter and I used the blanket stitch to bind the lovebird softies pictured. Make sure to bind the lovebird together with the wing sides out. Leave a 1 to 2-inch opening to add stuffing to each lovebird before sewing it shut. Step 8 – Fill the lovebird felt softie with wool or organic cotton stuffing. We love using wool felt and wool stuffing or organic cotton stuffing to stuff our handsewn softies because of the quality of the ingredients. Real and natural materials provide a wonderful sensory experience for the developing child. Step 9 – Finish sewing the felt lovebird softie together by hand. Use the same type of hand-sewn embroidery stitch that you began sewing your lovebird with in order to finish your felt softie. In other words, if you began binding your lovebird softie together with a blanket stitch, close up the remaining hole using a blanket stitch. If you started with whipstitch finish with a whipstitch, and if you started with a running stitch, finish with running stitch. A blanket stitch is shown in the pictures. Learning to sew is a wonderful fine motor activity for the developing child. If your child has never tried hand sewing, start with our simple sewing tutorial using burlap and yarn, or teach your kids how to sew a running stitch by hand. You can also make your own lacing cards out of sturdy fall leaves. Learn how in our fall leaf lacing beginning sewing project for kids. Another fun beginning sewing project that kids love is our pocket pet mouse complete with a free printable beginning sewing pattern. Have the kids sew their own pocket pal! You may also like this collection of easy heart sewing projects for beginners.